Since the pre-order bonuses for Persona Q were announced, fans have been wondering: where is the other half of the Persona-themed tarot card deck? Atlus has revealed the answer, and a little bit more to boot. 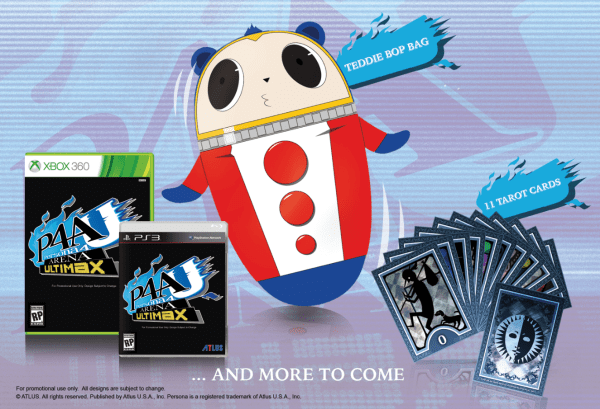 Pre-orders and first-print runs of Persona 4 Arena Ultimax will come with the other half of the tarot card deck and an inflatable Teddie bop bag. The opportunity to collect the full deck is a great added incentive for Persona fans to pre-order both games before their Fall 2014 releases. There’s also the curious “… and more to come” message found on the bottom of the promotional image above. We’ll just have to wait and see what else Atlus has in store for us. Previous Post:E3 2014: Nintendo Reveals Code Name S.T.E.A.M.